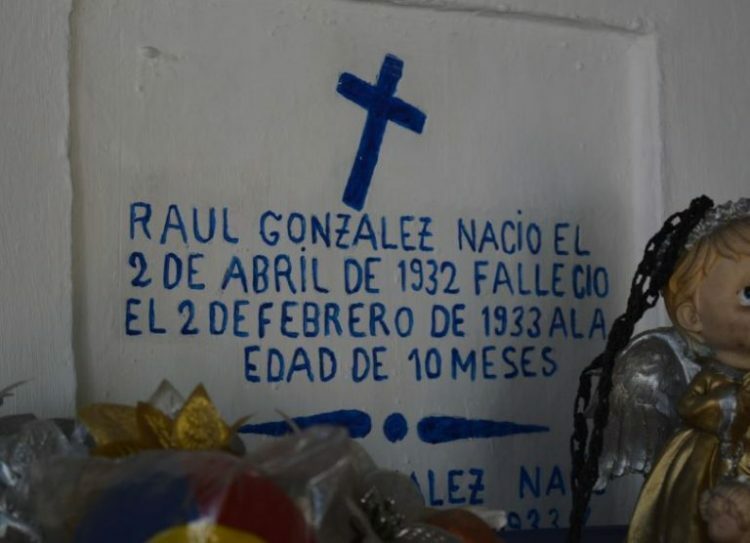 In the pantheon of San Francisco, the oldest in Acapulco, lies the tomb of Raul “Raulito” González, who was born on April 2, 1932, and died on February 2, 1933, at the age of 10 months. The tomb is the cleanest in the pantheon, the most visited, and it is always full of flowers, candles, and toys. These are all offerings for Raulito, who many believe performs miracles from beyond the grave. Raulito’s tomb lay forgotten for many decades, slowly deteriorating, until June of 2007, when a woman from Sierra de Atoyac arrived at the cemetery with her young, dying daughter in her arms. Susana Curiel García, the administrator of the cemetery, recalls that the woman asked about a child’s grave that had been completely abandoned by his relatives and that had neither fresh flowers nor candles. García pointed towards Raulito’s tomb, where the woman then spent an hour and a half praying for her daughter, who doctors had said would not live to the end of the day. After finishing her prayers, the woman left with the promise that if her daughter survived, she would return to give thanks to Raulito. Nearly two months later, the lady returned with the little girl who had fully recovered. She brought Raulito flowers, a bag of toys and sweets to thank him for the miracle. Her story quickly spread through Acapulco, and soon visitors in need of miracles started flocking to the grave. A second miraculous story tied to the grave of Raulito made the news a few years ago, when a worker of the municipal Public Security Secretariat lost control of his vehicle when the brakes failed. He called to Raulito for help, and miraculously gained control of the vehicle at that exact moment. The transit agent visited Raulito’s tomb soon after and repaired all the damage done by the elements since the 1930s. He also brought gifts to thank the spirit of the baby for saving his life. “Every toy that you see here, one or two toys are from each person that comes to ask for miracles” Susana Curiel García told the EFE News Agency, pointing to the plethora of toys covering the tomb of Raulito. She went on to say that, every day, between 10 and 15 people, sometimes upwards of 20, come from the villages of the southern state of Guerrero to visit the now-famous miracle-performing tomb. On April 2nd, Raulito’s birthday, and November 1, All Saints Day, the number of visitors reaches 100. Many believe in the power of Raulito, and some actually clain that the long-since-dead baby has answered their prayers. “I have already asked the baby for many things, and everything I have asked for has been granted, and I keep asking,” 80-year-old Francisca Jaime Camacho told EFE. However, she points out that people should not ask for too many things at once, or Raulito “could get angry”. She also advises people to bring him toys instead of candles. Raulito’s final resting place is constantly covered in toys, and cemetery staff have to remove them to make room for more. All the toys are then donated to orphans and needy children, as everyone agrees that the miracle-performing baby would rather other kids enjoy them.